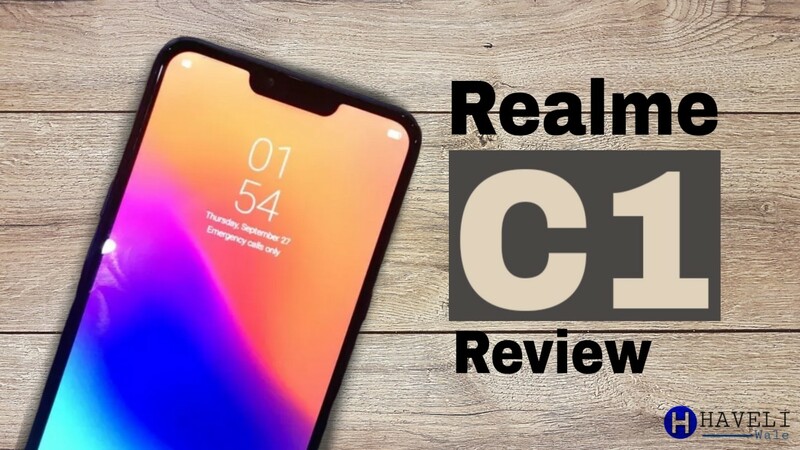 Realme C1 Review (Hindi/Urdu) – Hi Guys, Is Article me Realme C1 ka Review karunga or btaunga ke Realme C1 kesa mobile phone hai with respect to Price, Realme C1 Realme ki taraf se unexpected & interesting Product hai. Realme C1 Realme 2 Pro ki announcement ke saath announce kiya gaya hai, Realme C1 ke announce hone ke bad kafi log interested ho gaye is device me B’coz Realme C1 apne Low Price me jo Specs/Features provide kar raha hai wo Amazing hain. Realme C1 ki Build Quality se ye mobile Low Price ka nahi lagta B’coz Realme C1 ki Backside par Plastic finish hai But wo proper glass ki feel provide karti hai or mobile kafi premium lagta hai, Also Realme C1 completely Plastic ka build hai but no issue B'coz of Low Price. Realme C1 ki backside par fiber glass hai jo kafi Amazing hai or Premium feel provide karta hai or side me Plastic ka rim diya hai jis se better grip milti hai And overall device ka weight distribution kafi better hai, device heavey feel nahi hota. Realme C1 ka Display Amazing hai or kisi ne bhi Realme C1 ka yeh display expect bhi nahi kiya hoga, Realme C1 me 6.2 inches ka HD+ display with Notch hai And is Display ke colours bohat Amazing hain, Contrast & Saturation bilkul point ke hain. Realme C1 ke Viewing angles bhi kamal ke hain or sharpness bhi budget ke according better hai, overall Realme ne kafi amazing quality ka panel provide kiya hai or Realme C1 ka Display high Quality ka hai with respect to it’s Price. Realme C1 me kafi stable hardware milta hai, Snapdragon 450 jo 14nm ka Processor hai or saath me Adreno 506 GPU is device me milta hai, Realme C1 me 2GB RAM or 16GB Internal Storage milta hai or 16GB se just 7GB use karne ko milega. But Realme C1 me Dedicated Micro SIM slot hai to SD Card laga kar Storage ko increase kar sakte hain. And Realme C1 me Android 8.1 par colour OS milta hai Colour OS me bohat sare Features or Customization milte hain. Colour OS kamal ka Operating System hai bohat ziyada Customization milti hain or kafi Fast hai But iska Experience reliable nahi hai but iska yeh matlab bilkul nahi ke device slow hai Device kafi better Perform karti hai. Realme C1 ko Gaming device consider nahi kiya ja sakta hai B’coz of it’s Price & Storage But Realme C1 me PUBG low settings par run kar sakte hain koi ziyada problem nahi hai or Asphalt 9 jesi Games bhi run kar sakte hain B’coz Adreno 506 kafi capable CPU hai. Realme C1 me backside par Dual Camera setup with LED Flash milta hai, 1st Camera 13 Megapixels ka rear Camera & 2nd Camera 2 Megapixels ka depth sensor hai, Realme C1 ka rear Camera daylight me solid performance provide karta hai. Realme C1 ke rear Camera ki Daylight me better dynamic range hai, colour reproduction bhi amazing hai or kafi detailed images capture karta hai, Realme C1 Lowlight me acha perform karta hai colour reproduction achi hai but ziyada detailed image capture nahi karta. Realme C1 ke rear Camera ka Portrait mode me kafi improvement ki need hai, Portrait mode me Edge detection bilkul bekaar hai or rear Camera se video recording me Electronic image stabilization nahi milti to rear Camera se video ziyada better record nahi ho sakti. Realme C1 ki front side par single Camera milta hai jo 5 Megapixels ka hai But yeh 5 Megapixels ka Camera kafi detailed images provide karta hai, Selfies me dynamic range, colour reproduction kafi amazing hai or is Camera ke skin tons bhi better hain. Realme C1 ke front Camera me bhi Portrait mode milta hai or yeh Portrait mode kuch better hai Edge detection me to overall Selfies kamal ki capture hongi, And again front Camera ki video recording ziyada better nahi hai, Realme C1 ke Camera kafi Amazing hain with respect to it’s Price bedget. Realme C1 me 4,230 mAh ki Battery milti hai or yeh kafi Amazing baat hai B’coz Realme C1 me HD display milta hai Full HD nahi to Battery consumption bohat Low hai or Realme C1 me Snapdragon 450 milta hai jo bohat ziyada Power Efficient hai. Realme C1 ki 4,230 mAh ki Battery normal use me 2 Days ka Battery time provide karti hai but Realme C1 ke box ke saath 5 volt 1 ampere ka charger milta hai jis se is device ko charge hone me 4 Hours se bhi ziyada Time required hai. Realme C1 ki Sound & Call Quality bhi kafi Amazing hai or Call ke liye bhi better performance milti hai or Songs ke liye Speaker ka Sound bhi better hai, Realme C1 me Fingerprint scanner nahi milta hai but Face ID milti hai or Face ID ki performance normal hai, also Lowlight me Face ID bilkul perform nahi karti hai. Realme C1 apni Specifications or Price se aik better choice ho sakti hai but just kuch logo ke liye, wo log jinki Price range ziyada nahi hoti wo log Realme C1 ko buy kar sakte hain B'coz Realme C1 ki Specifications bohat Amazing hain Price ke according, But agar kisi ki Price range Realme C1 se kuch ziyada hai to unko or bhi better choices milti hain.